It’s tomato season and farmers markets are busting with colorful arrays of tomato varieties. I’m going to be sharing secrets to finding the perfect tomato and I’ve got a tomato dish that is simply delish. -Don’t worry about tomatoes with weird shapes. Even cracked skin is okay, but leaking juice and soft spots are not. -Choose tomatoes that feel heavy for their size. 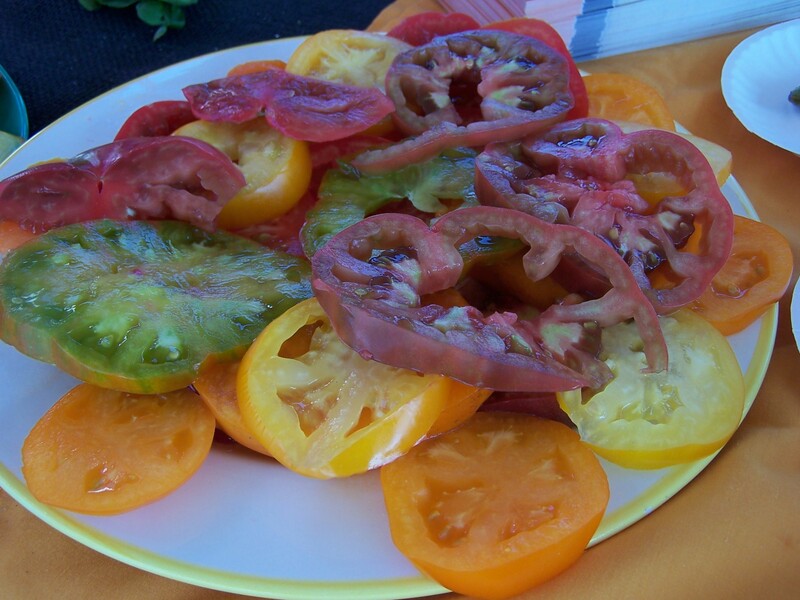 -Taste This is where farmers market shopping really pays off – you can often taste the tomatoes before you buy them. Treat tomatoes gently. Heirloom tomato varieties, in particular, tend to be quite fragile. So don’t pile the tomatoes in a bag where their weight will squash one another, and always pluck vine-ripening tomatoes off their vines (or the vine stem off them) to avoid having the sharp vines poke holes in your precious cargo. But above all never refrigerate tomatoes (one of the biggest mistakes many make). Temperatures under 50° turn tomatoes mushy and mealy. Now that we know how to choose tomatoes and store them properly – let’s get cooking! 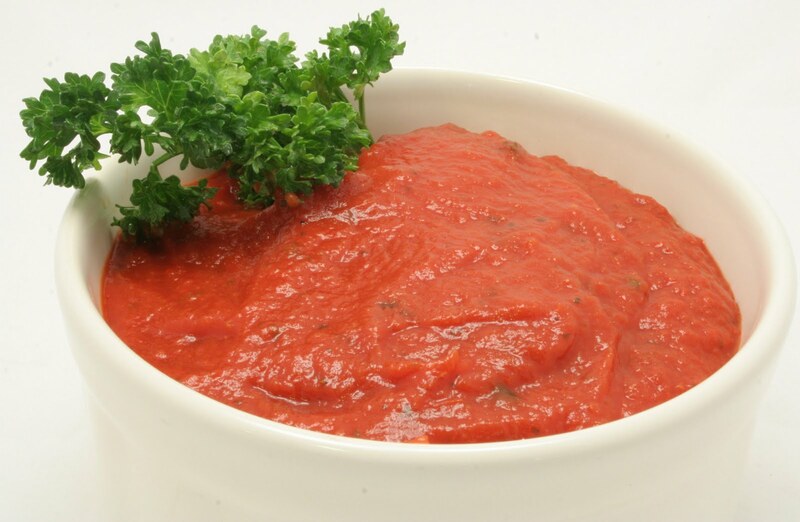 One of my go-to’s in the kitchen for an easy recipe is always homemade tomato sauce. And, making your own homemade sauce is simple and healthier- as the canned and jarred stuff (which is okay for a substitution occasionally) is full of added preservatives. Both large and small tomatoes work great for sauces – like beefsteak and plum. First, you will need to remove the skins of the tomatoes. The easiest way to do this would be to par boil them. On the bottom of the tomatoes, cut an “X”. Then, place the tomatoes in a pot of boiling water for 60 seconds or until the skin begins to come loose. Remove the tomatoes from the water and place in an ice bath (large bowl of ice water). Once the tomatoes have cooled, remove the skins and chop the tomatoes. I make a couple batches of par boiled tomatoes and then freeze the cored, peeled tomatoes to cook sauce in the winter as well. This will allow you to savor the tomato season year-round. When it comes to seasonings I like to say recipes are just “roadmaps” to guide you, but that you don’t have to follow. I typically add onions, garlic, oregano, basil and olive oil – which are tomato sauce basics. But, feel free to also add parsley, thyme,red wine, fennel seed and even bay leaf. I also try and use fresh herbs from my garden, but remember if you use dried herbs use less because the dried version is much more potent. Want some more zing to your sauce, then try a couple shakes of red pepper flakes. Saute the onions and garlic, then add the par boiled tomatoes and roasted 3 roasted carrots. (Yes, carrots. I always add roasted carrots to my sauce. I have found it makes a richer tasting sauce.) Add the other ingredients of your choice and cook on medium for about 40 minutes, until thickened. I puree my sauce in a blender for a smoother sauce, but you can leave in chunky. I freeze my sauce in gallon freezer bags and I also can my sauce throughout the summer. Savor tomato season year-round with your own homemade tomato sauce. Check out your local farmers market for a variety of tomatoes to get you started! If you want to try some of The Market Lady's fresh from the farm recipes or watch a cooking demonstration using produce from the farmers market, go below to the "Categories" Section for a dropdown menu of videos, recipes and much more! Or should we say "Ladies"? The Market Ladies are a group of professional food folk that love fresh and local foods. Sponsored by the Webb City (MO) Farmers market with support from the USDA specialty crops program, the Market Lady features weekly Saturday cooking demonstration at the Webb City market as well as tips and recipes. Join the fun and freshness - enjoy the bounty at your local farmers market!